Stefano Mazzolini was born in Parma in 1968. At the age of 9 he was nominated for the "Drawing and City" award organized by the municipality of Parma. In 1989 he graduated Master of Art in pictorial decoration, at the institute Paolo Toschi of Parma. He devoted himself to the restoration and conservation of wall paintings for several years. In 1990 he lived first in London and subsequently moved for a short period to New York. He knows local artists with whom he shares a loft in the Queens district. 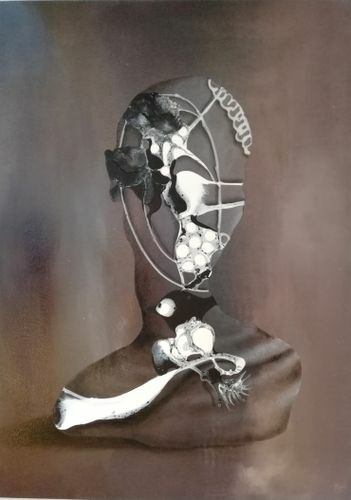 While on the canvas with oil expresses his vision of the hidden, beyond the appearance of being, very precise shapes to represent an androgenic human figure, an essential profile of the human, portraits, people formed by a structure as complex as anything that it lives and shapes the individual. By engraving and applying the cuts on the canvas shows the extrusion of the shape.